‎It’s so easy to get off track in holding true to our values & beliefs. It’s important to be able to take a step back & look at our lives from time to time and make sure we’re where we wanna’ be. Most of you know I’m very passionate about living as plastic-free as I possibly can. Over the last few months I’d resorted to buying those bagged salad mixes (organic of course), you know, they come with some crunchy things for the top, ususally some dried cranberries or pumpkin seeds, and a pack of salad dressing included. So convenient, no chopping of multiple things, and really tasty too, I was really digging them. I felt good about putting an organic salad on the table…. Until a few nights ago when I threw one together, then took a good look at the mound of plastic on my counter: 4 different plastic bags laying there, for 1 salad. NO MORE. I’ve banned myself from purchasing them. Yesterday I shopped at my local food co-op & brought home a pile of fresh produce with 0 plastic bags, it just felt so much more in line with my beliefs. Vejibags came into my life at the perfect time for this plastic-reduction mission! I love what they are made from, and that it is truly a made in USA product from start to finish!! Made from: Undyed, Unbleached, 100% organic french terry cotton, grown by the Texas Organic Cotton Marketing Cooperative, and hand sewn by employee-owned Opportunity Threads, in Valdese, North Carolina. There is nothing to not love about that! How they work, in their words from their website: OUR ORGANIC COTTON KEEPS PRODUCE VIBRANT FOR UP TO TWO WEEKS WITHOUT PLASTIC. While conventional plastic bags and boxes suffocate vegetables by trapping stale air and ethylene gas, our damp cotton bag keeps moisture-loving vegetables alive and crisp in a high humidity, breathable environment. Just like cut flowers, vegetables need water to stay vibrant. The key to keeping veggies crisp is moisture. When damp, the cloth Vejibag keeps moisture-loving vegetables moist and crisp in a breathable but high humidity environment. Moisture slowly evaporates from the surface of the bag to circulate air and keep the vegetables “breathing.” The slightly moist environment of the bag keeps vegetables crisp far longer than vegetables stored in a plastic bag. And indeed, they really truly do what they say! I’m super in love with my Vejibags! I prepped salad for the week on Sunday, we finished it up on Thursday and it was as perfectly fresh as when I chopped it on Sunday! We had a salad nightly, on Tuesday we did taco pizza & I was able to just grab a handful & throw it on top & viola, done! I’m soooo happy to be cutting plastic out of this equation, saving money on the produce vs buying the pre-bagged salad mixes I had fallen into a rut of purchasing, and I know these bags will pay for themselves in no time!! Below: top left= prepped salad for several days in the Standard Bag. Top right= a head of lettuce, a bunch of kale, a couple bell peppers, a couple cucumbers, the “bulk” veggies left after the salad prep was done. They will be used up in other meals throughout the week, this is the XL bag. The bowl in the front is an example of our nightly salad. The already chopped, mixed greens/veggies get topped with feta, pumpkin seeds that we roast ourselves, avocado, sprouts if we have them, then dressing of course. A Facebook update I did: Tonight we finished up the salad that I prepped on Sunday. It’s Thursday, so that was 5 nights of salad. It looked absolutely as wonderful tonight as it did when I made it on Sunday. I’m a believer in the Vejibags 100%. Expensive yes, but any replacement to plastic is worth it to me!! I know I will be using these for years to come. Below pic= what was left on Thu. The XL bag is HUGE. There are 2 heads of lettuce, 1 bunch of kale & parsley, 3 cukes & all the broccoli in here (from the above pic showing what I brought home from the food co-op plastic-free)! Below is my crisper drawer, the XL bag with all the above & the smaller ‘standard’ bag with the week’s prepped, chopped salad both take up the entirely of 1 crisper drawer. The other has things like grapes & other fruit (one area hard to get away from plastic, I’ve never found raspberries for example that are not in a plastic clam shell). But, we do what we can, when we can, where we can. And being aware of plastic use is HUGE on my awareness agenda! Finally, thank YOU for taking the time to read my thoughts! I am not an MD, just a Mom with a kiddo dealing with Lyme. I wanted to share what I’ve learned in the past few years, with the hope it may help 1 person just beginning on this journey. This is not an end all & be all by any means, it is simply a start. Unfortunately, I know way more about this ailment than I would like to. I live in SW Wisco, and honestly can say there are very few people I know locally whose lives have not been touched by Lyme one way or another. My Son (7 years old at the time I’m writing this) was diagnosed 2 years ago. My niece (5) has tested positive. So has my Sister. So have many, many friends & acquaintances. My Mom has been a nurse in our local Complimentary Medicine clinic, under the local Lyme-literate MD, for ~20 years. I do not think calling this an epidemic is an over-statement. The bite: They say the tick needs to be embedded 24+ hrs. I do not think this is true based on our experience. My Son was bitten in the Fall of ’16. He says: Mom, I think there’s a tick crawling behind my ear. I look, don’t see anything. A minute later: Mom, I think I just got bit (I’ve been bitten by ticks several times & you usually do feel it). I look where I had just peeked a bit ago & sure enough, he just got bit. I pulled it out immediately; it was in him a matter of seconds. Then I watched as his body flushed cherry red from the bite spot behind his ear, down that side of his face, and down his torso all the way to his waist, it was crazy & totally freaked me out. I whisked him away into a cool bath & it calmed down pretty quickly. But it was definitely drastic, and definitely instant. There was never the iconic “bullseye” rash, and what I’ve learned is many who’ve been diagnosed never see that rash, many never see the bite at all…Standard protocol here is 3w of antibiotics for any new deer tick bite. As much as I loathe antibiotics, I also know how serious Lyme is, so we followed the protocol & didn’t think a whole lot of it for the next year. The following Summer he had a few instances of random fever, headaches, nothing frequent, nothing super worrisome. The next Fall, 1 year after that bite, he started pre-K 2 days/week. He loved it at 1st, which surprised me being he had never been to daycare a day in his life (he was 5), never been to a “babysitter” other than my Mom or our/his best friend’s house. After about the 2nd week (of just 2 days/week), something changed. He would go on a Tue morning, totally healthy & happy, and by 1pm the school was calling to tell me he was in the nurse’s office, he had puked. 1st time wasn’t a big deal. 2nd time in the same week (again, 2 days/week) and I started to worry. Then it just kept happening. By mid-day he was miserable. Yes, he missed me, but he was getting physically ill. It was the end of Summer & still quite hot. The days he did make it through the whole day, when I’d go to pick him up, he would be super beet red in the face, just dripping with sweat (they had a last recess right at the end of the day). They told me he had started just sitting on a bench during recess, totally not something I could imagine him doing. I now know that he, and many Lyme patients, have a very hard time with thermal regulation. The principal was so wonderful & kind, and suggested we try 1/2 days & see how that went. We tried the 1st 1/2 day, and when I got there to pick him up at noon, I saw him round a corner coming in from outside, and he was crying. I scooped him up in a big hug, we cleared out his locker, and I withdrew him right then & there. At the time I attributed all this to our full-time family, attachment parenting lifestyle, but looking back I really think his Lyme symptoms played as much or more of a role. He still hadn’t been diagnosed yet though…. The headaches just kept coming, even after I pulled him out of school. I think school was the stressor that kinda’ ‘broke the camel’s back and made these symptoms present themselves consistently. In the couple weeks after pulling him out, he just had way too many headaches. I’ve never had a migraine thank goodness, but that’s what he seemed to experience. He’d gloss over, I could see it in his eyes. The only thing he’d want to do was lay on the couch & snuggle me. He’d pass out for an hour or so, wake up & vomit, sleep a little more, then usually feel much better. I knew this was not normal & his body was telling us something. I remembered that tick bite a year ago & just had a hunch….. If test A comes back negative, they say: good to go, no Lyme here. Well, test A is notoriously false negative. And since my Mom knows this, when the clinic called to say test A was negative, she urged me to call them & request they do the western blot. Guess what? That came back positive on 3 bands: chronic, acute, Lyme specific (shows that his body was making antibodies in response to Lyme). Had it not been for my Mom’s knowledge & urging, that 2nd test never would’ve been done, and we may still be wondering why the headaches out of nowhere. Guess what else is entirely messed up about the testing? According to the CDC, if 5+ bands are not positive, they deem that a negative result. So even though my Son has THE band showing he’s making Lyme antibodies, they would say he does not have Lyme. So back to that bite, can I say for certain that couple of second bite is when he contracted it? No, I can’t. It’s possible he was bit another time and no one saw it. MANY people who have Lyme did not see/feel a bite, they never saw the tick. Also, there are more & more theories that mosquitoes & other carriers might be spreading it as well. But my Mama gut says the 1 known bite we witnessed was when he got it, regardless of the “it has to be in you 24 hr” myth. 2 years after the initial test, I wanted to have a re-test to get an idea of where we were at. I had treated with natural remedies on/off, and was more curious that anything. He had long periods of time, months & months, with 0 symptoms, but every now & then an occasional headache & my curiosity urged me to re-test. To complicate matters greatly, he had a deer tick embedded in his head the day before we received those results… That test showed the chronic band to still be positive, although the CDC doesn’t deem it positive unless 5+ bands are positive, and he only had 2. It was encouraging that he was down to 2 bands, from 3, so it gives me hope that our remedies were doing something! But then we were left with the dilemma of treating a brand new bite. Uggggghhhhhh! Treatment: This is the SUPER difficult part. And I’m not an expert, and not here to diagnose or treat. You’re going to have to do a lot of research, as well as trial & error to determine the best treatment for your case. But I will list some of the natural remedies we turned to, that I do feel helped. On antibiotics: Yes, they absolutely have their place in western medicine. Yes, I’d do pretty much anything to knock Lyme out of his system. But here’s what I’ve learned about Lyme: abx just beat the spirochetes into hiding, they do not kill them. They can treat secondary symptoms and co-infections, but not the Lyme spirochetes themselves. Many docs will prescribe 10 days of abs for a tick bite, many others maintain that needs to be AT LEAST 21 days, if not 6w. As most of you know, long term abx use comes with a whole host of other side effects… We did the standard 3w protocol with the 1st bite, for the 2nd bite we were ready to go the 6w route, to try to really get on top of any possible infection from the new bite, as well as really beat back the old one. By 4w, my Son was just not doing well. He had headaches frequently, and just was not healthy. The tough question was: is this because the abx were working, killing unwanted invaders in his body? Sometimes you feel worse before you feel better… But I just couldn’t do it anymore, we quit at 4w. I know of people who are on consistent, long term antibiotics for Lyme, like pretty much indefinitely, and I just know that is not the path for us. Steve Buhner Protcol: One of the foremost respected authors on this topic, from a natural-healing perspective, from what I can gather. He has written multiple books on the topic. There are books for dealing with co-infections, the list of available titles goes on & on. So many of us wish for a simple, easy to understand & implement protocol, telling us what to do when. That just does not exist with Lyme… But he should definitely be on your list of authors to read up on, if you’re dealing with this ailment. There are FB groups dedicated to his protocols too. The Knotweed/Catslaw regimen we were doing was based on his recommendations. I don’t remember that he was recommending Stevia at the time, but based on new (to me) research I read up on, I felt it was promising enough to add, with little to no side-effects. Stevia, Japanese Knotweed, Catsclaw are some of the most promising remedies I learned about following the Buhner protocol, and I used them with my Son on & off over the course of a year. As I discussed recently with a friend battling Lyme, you really don’t know where to start. And then you do start, and you have to devote months to that treatment. And you may feel worse before better. You really can’t say that X is working. It’s so, so difficult & frustrating to navigate this world. We ALL want to just be able to go see a trusted medical professional, get told: yes, you are positive, this is the plan of attack, come back for a follow-up in a month. That just doesn’t exist with Lyme. There are so few docs that are Lyme Literate, and even among those, treatment varies widely, and results are not consistent from patient to patient. His future: Lyme is an ailment you treat based on symptoms really. There’s a good chance he may always test positive for it. But as long as he isn’t showing symptoms, we pretty much forget about it. And I’m grateful to say he’s not shown any unexplained, prolonged, out of the ordinary symptoms for quite some time. So, prevention then remains our focus. After his 2nd bite last May, we shaved his head (he was happy to match Daddy’s haircut & had been requesting it already). That makes it soooo much easier to see those tiny critters. My daughter prefers short hair at this time too, and it’s almost whitish blonde, so easy to see movement or anything of color. I picked an INCREDIBLY tiny tick off her forehead, I can’t even believe I saw it. It had not yet bitten her, but was headed for her scalp for sure. We are an incredibly outdoorsy family, surrounded by hundreds of acres of woodlands. As much as I loathe & fear this nasty little critter, I will not let it shape our love of the outdoors. After a hike outside, we do a thorough check, shedding outside clothes at the front door & leaving them out there. Conclusion: This is my least favorite topic I’ve ever written about. I feel it is surrounded by doom & gloom. But, I’m forever the optimist. I find hope in the fact that we caught it early in my Son, not after 10 years of unexplained symptoms. He is young, and that helps his odds at fighting this. We know what we are dealing with. I’m so thankful my Mom was able to advise to request the Western Blot test after the 1st, standard test, was negative. Otherwise we, like SO MANY others, may be undergoing every test in the book to try to figure out what was going on, with no answers. While sometimes I wish it were me battling this, not my Son, I remind myself that he’s lucky to have me as a non-affected advocate & researcher. My friend who is in his 50’s complains terribly about the “brain fog” that is associated with Lyme, and I’ve heard that from others too. It’s really hard to research & plot the best course of action when you cannot think clearly. So, I’m able to do that for my Son. –I pull orders in the order emails are received. If the person before you claimed an item you want, I let you know. I pack up your order & send an invoice with exact shipping. –Make sure you include your mailing address so I can determine if flat or regional is cheaper. –You pay via PayPal FRIENDS/FAMILY so I don’t lose to fees, otherwise I’d have to charge a fee for the club, something I’ve avoided for the 4 years I’ve been doing this. Or you can pay off your QuickBooks invoice using your checking account OR send a check if you’re not comfortable with that. Just be aware if you send a check I likely will not receive it before I leave town late next week, so your items will sit in my office an additional 2 weeks. BAREFOOT BOOKS: I have almost all of the following in my personal collection at home & cannot speak highly enough about them, I treasure every Barefoot Book, puzzle & game we own. Yes, they are printed in China but they have a very strong sustainability mission. You will not be disappointed! Of the 3 R’s most of us are likely familiar with: reduce, reuse, recycle, I firmly believe that reducing is the most important. I’m on a never-ending journey to constantly use less. There is ALWAYS that next “something” on my list that I can improve upon. A few months ago I made the change to reusable cloth menstrual pads (will link to that review below). A few months ago I made the change to cloth t.p/wipes for myself! This is an area that I will admit even myself cringed at a few short years ago! But eventually you just get there…. I cloth diapered both my kids, a total of ~4 years between the 2 of them. I washed a lot of diapers, and I washed a lot of cloth wipes with those diapers! I’m currently using these just for myself, and just for “#1 (pee), but that accounts for most of my t.p usage, so I’m very, very happy to make this switch. I’m not pressing my daughter to switch at all (she’s 5) but I’m hoping she’ll choose to make the switch on her own, so she can be like her Mommy 🙂 Otherwise, I share my home with 2 boys, my Hubby & Son, so they use very little paper! It was just a matter of time before I came to peace with the idea of using cloth myself, and I’m so, so happy with this switch! A pic of my organic, flannel, super soft, toilet “paper” (NOT!). Thanks to my request, Anne switched to organic material, I don’t really want to wipe the most sensitive part of my body with anything else…..
A set of 5 wipes are $12. They are made from organic flannel (fabric meets GOTS certification -100% organic cotton flannel fabric using only low impact, organic dyes). Also, sewn with GOTS certified organic cotton thread. Flannel wipes are perfect for personal cloth (toilet paper), napkins, baby wipes, etc. Available in 7 or 8″ sizes! I keep a small garbage can w/ lid next to my 2 toilets, and toss the wipes in there after each use. When I’m down to just a few, I wash them, this happens a couple times/week. No, they don’t get stinky, no one in the family notices them sitting there! I originally did a review of her reusable Swiffer pad way back in Nov of 2013! I”m still using & loving them! Did you know, you can flip them inside out when one side is all dirty/dusty, and use that side before laundering?! Great hack! She usually offers around a dozen of these per buying club, at just $8 each! I also use Anne’s washcloths (middle of the pic in blue/white). I have a stack of ~15 or so. They do fade over time & do tear over the years, and I’m talking years. So maybe once/year I buy a 1/2 dozen or so new ones to replenish my stack, and the worst of the lot get turned into rag bag material (Hubby might use to check oil, etc). I got my stack of white thermal bamboo “tissues” (top right) from a different vendor who no longer offers her products, so Anne has picked up the slack there & started to offer those too. I have not used a “Kleenex” in years! The cloth napkins in this pic are also from that other vendor, but you can use any of Anne’s wipes as napkins too. I’m sharing this pic to show you what it looks like to make a conversion to cloth dish products, napkins, “Kleenex”. You can comment ‘sold’ on any item(s) you want for the June order beginning at 10am CENTRAL on 6/1, with a deadline of 6/10 @ midnight central. EMAIL ME YOUR LIST: ecofriendlyusabuyingclub@gmail.com. I pull & pack up your order & send you an invoice with your total. You pay (PayPal, direct bank transfer, check), I ship via USPS flat/regional rate. Next order will be June 1st-10th, and you can get whatever you want from the 25-30 vendors who will be offered at that time. Organic bamboo Ice teethers 1x angel @$12.95 ea (used to be $25). She is liquidating her stock, no more are being made. One of these buying clubs there will be no more…. 4 oz Euc Glob @ 1/2 price @ $11.50 (was $23, label isn’t perfect as something else in the box broke & spilled on it). 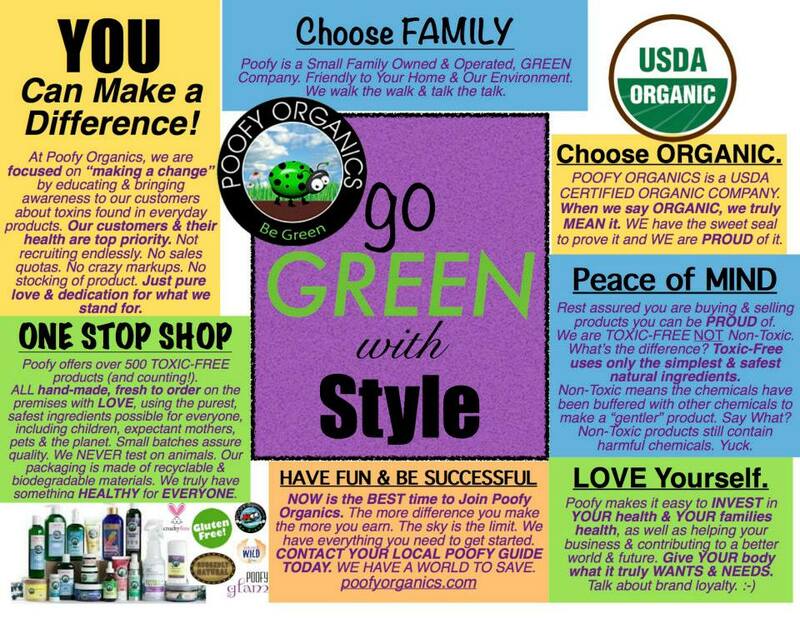 Looking for like-minded, motivated, dedicated people to join my Poofy Organics team! 27 Jul 2015 Comments Off on Looking for like-minded, motivated, dedicated people to join my Poofy Organics team!